A sturdy, standard ROPS and heavy-duty protective screen provide rollover protection to the operator and passengers when seatbelts are also worn. The ROPS is OSHA 1928.52 compliant. 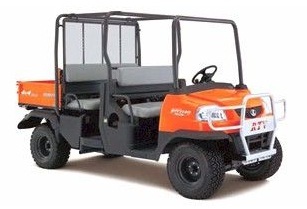 quick, responsive and agile on all terrains, Kubota RTVs were first in their class to be equipped with hydrostatic power steering. MacPherson Strut-type suspension on each of the front wheels (an independent suspension system) maximizes shock absorption and minimizes body tilt. Frequent braking is required when taking on hilly terrain. The light-step, wet-type disc brake allows you to stop quickly and effortlessly. The durability of this brake means no drop in performance due to wear. Exclusive to Kubota, the high-performance, three-range VHT Plus offers the performance required under demanding conditions. It allows you to tackle hills with string acceleration, smooth, engine-assisted deceleration and superior “hill-holding” abilities. VHT Plus has the power and control to safely take you just about anywhere. The Kubota D1195 3-cylinder engine with 1123cc and 24.8 hp provides for excellent acceleration and the ability to take on almost any terrain or task. First, fold the front and front sides of cargo bed which have been build with hinges to convenient fold up and in toward the back of the bed. Second, flip down the two-person, hinged bench seat and lock it in place. Third, slide back the protective screen and attached seat back all the way to the bed and lock in place. Now you can ride. Reverse these actions for access to the RTV’s full bed capacity. the instrument panel offers a convenient, quick-read layout to allow operators to keep their eyes on the road. Monitor lamps include oil level, charge status and more. the speedometer allows operators to more precisely monitor their speed while working. for driver and 3 passengers. These belts are easier to fasten and feature an anti-cinch mechanism that detects excess shock and compensates accordingly. dump just about anything you can think of from the whopping 18.3 cu.ft/11.7 cu.ft (2-seat or 4-seat configuration) capacity cargo bed. An easy-to-operate lever activates this hydraulic bed lift system in either the 2-seat or 4-seat configurations. on each rear wheel, the semi-independent suspension-type DeDion axle, leaf spring and shock absorber react together, minimizing shocks while negotiating rough terrain. A metal fitting on the tailgate allows the gate cables to swivel, which increased durability and reduces maintenance.